Ben Hur or Benhur is an unincorporated community in Limestone County, Texas, United States, located about 25 miles east of Waco. Named "Cottonwood" when it was founded in the late 19th century, it changed its name to "Ben Hur" (possibly in honor of Lew Wallace, author of the book Ben Hur) in 1895, because several other communities in Texas were named "Cottonwood." A post office was located there from 1895 until 1906. The town was also mentioned in the 1993 drama film A Perfect World where a suspect, Terry James Pugh, was found dead near this area. 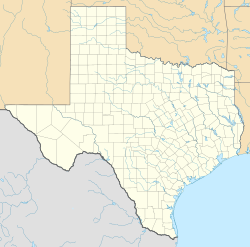 ^ a b U.S. Geological Survey Geographic Names Information System: Ben Hur, Texas. Retrieved on 2009-01-26. ^ Tarpley, Fred (5 July 2010). 1001 Texas Place Names. University of Texas Press. p. 23. ISBN 978-0-292-78693-6. This article about a location in Limestone County, Texas is a stub. You can help Wikipedia by expanding it. This page was last edited on 14 January 2018, at 18:53 (UTC).